There’s a way to clean your baseboards without getting on your hands and knees, which means you’ll no longer dread this chore, and your back will thank you. Every time you walk past your dusty dining room, you think, “There has to be an easy way to clean baseboards. Why does this have to be so hard?” (And then you’ve most likely shed a tear or two at the thought of having to walk around on your hands and knees with a rag in your hand because IT HURTS). I’ve been there. Now that I’ve seen the light, there’s a much more effective way to do this and it’s life-changing (okay that may be a little dramatic, but it’ll definitely change the way that you look at this chore) because it’s pain-free and actually kind of fun! 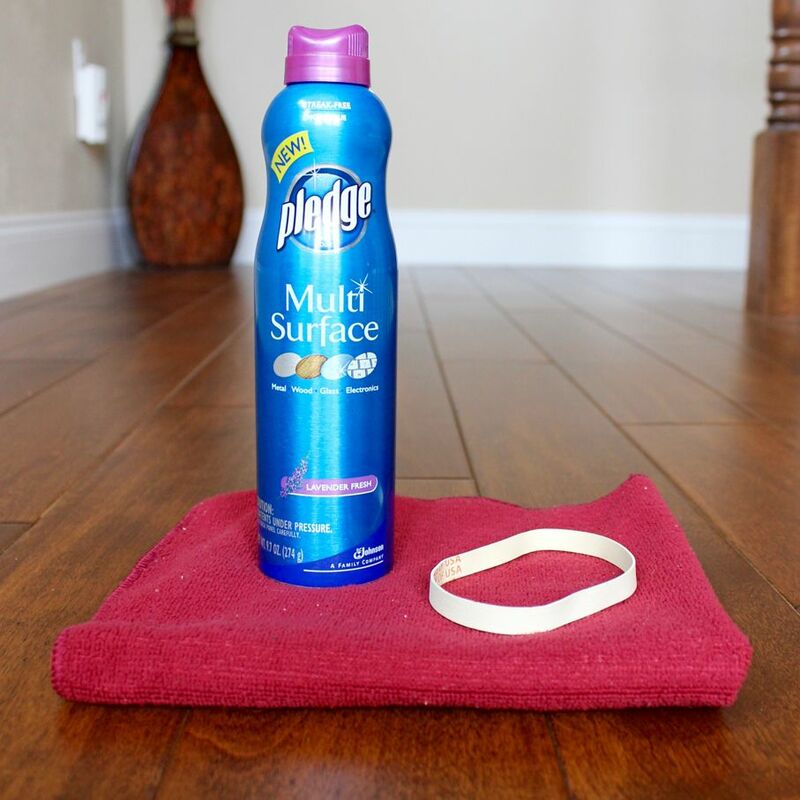 Here’s the easy way to clean baseboards without having to utilize your acrobatic skills. Microfiber rag. If you have a rectangular shaped microfiber rag, that will work best (but a square shaped one will work too)! Rubber band. One large, thick rubber band (or two large thinner rubber bands) will do. Dusting spray. Any multipurpose or wood spray that can be used for dusting is perfect for the job. This is where you’re going to transform your trusty kitchen broom into a game-changing baseboard duster. Let the fun begin! 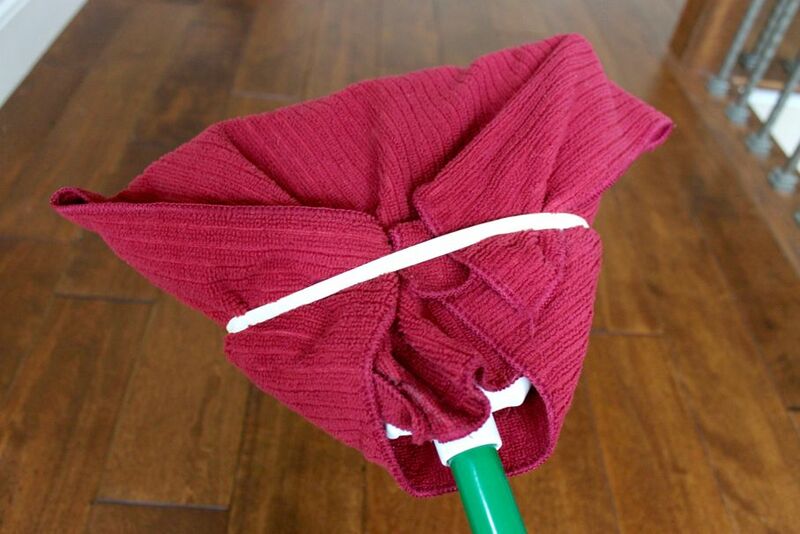 Take your microfiber rag and drape it over the bristles of the broom so that it hangs evenly on both sides. 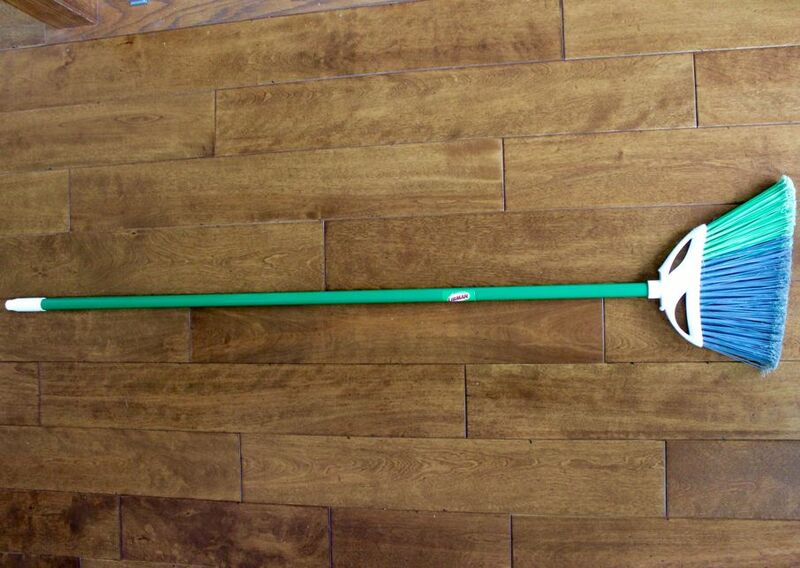 Then put your large rubber band over the handle of the broom and bring it up toward the bristles. Fold the rag around the bristles and keep it in place by putting the rubber band about a third of the way onto the base of the bristles. 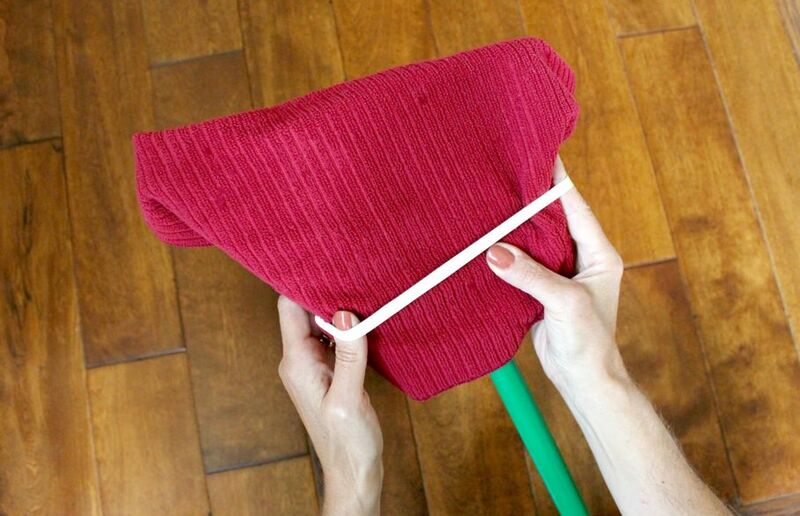 Tuck in any loose corners in the back to make sure that the rag is tightly fastened. 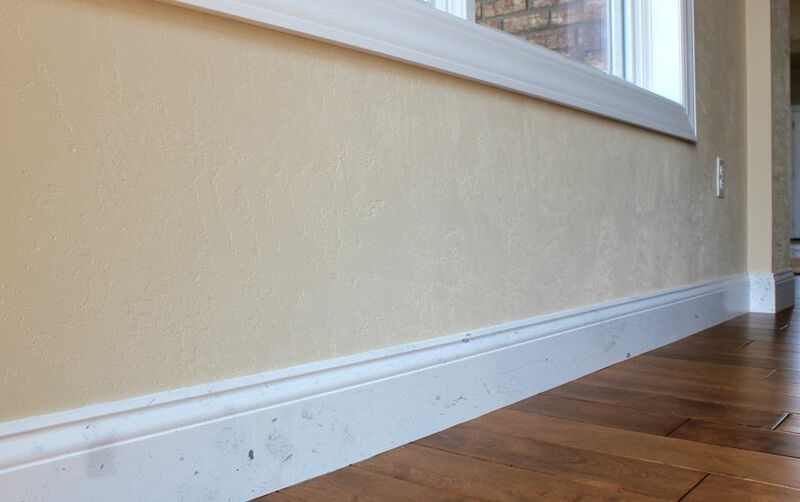 Now that you have your beautiful baseboard cleaner ready for action, it’s time to complete the full prepping process! 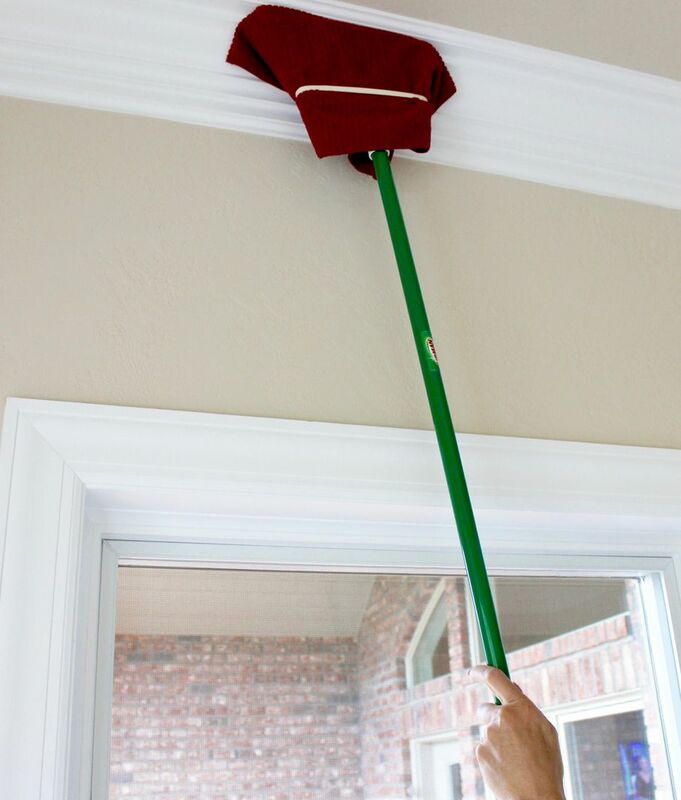 Take your dusting spray and spray the bottom of the broom bristles (you can spray a decent amount so that it’s damp, but just don’t soak it). Now you’re ready to get to work (as long as you’ve had your coffee. If not, do that first. In order to get any job done well, coffee must always come first). Step 4: Reveal Your Brand New Baseboards in Just a few Quick Swipes! It’s time for the endgame. 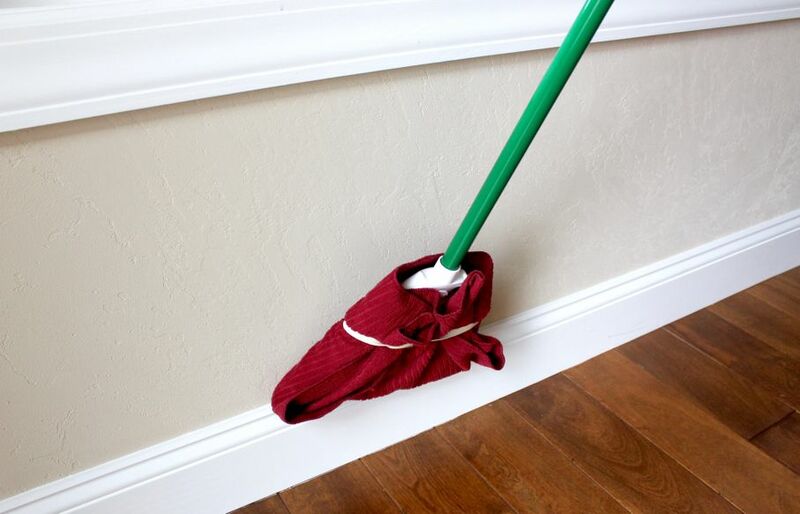 Run your broom along your baseboards, first along the top, and then along the bottom. Then swipe it again in the other direction to get anything you may have left behind on the first go-around. Once you’ve done one room, add some more dusting spray before starting in another room. After all, why not move onto others while you’re at it? This tool also has a bonus feature: it’s prefect for crown molding! Having to balance on a stepladder with a rag in your hand isn’t the safest method, and this tool eliminates the need for a ladder. Just lift the broom up to the crown molding and run it along the top and bottom of the molding as you did with the baseboards. It’s literally that easy. (And if you’re feeling extra ambitious after you’ve cleaned all of your baseboards and crown molding, take a swipe at the tracks on your sliding door. Trust me, you’ll be glad you did. It feels good to have accomplished so much in so little time)! 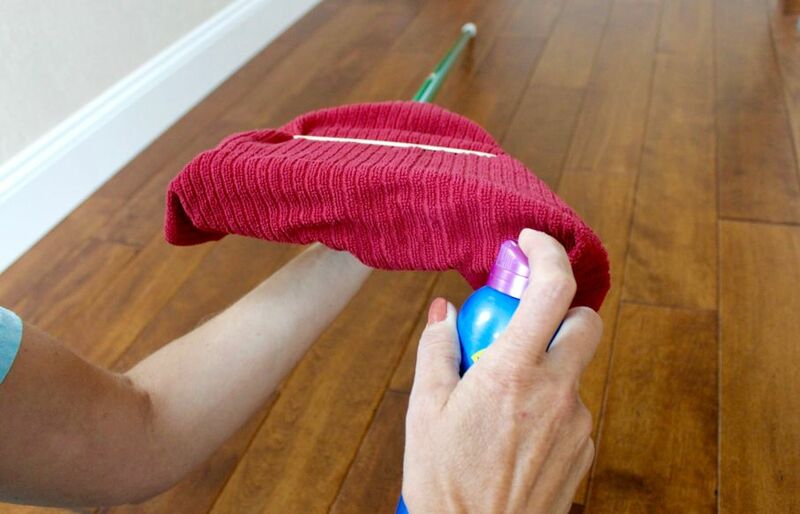 Now that you’ve found a really easy way to clean baseboards, are you looking for other fun hacks to tackle your household cleaning chores? 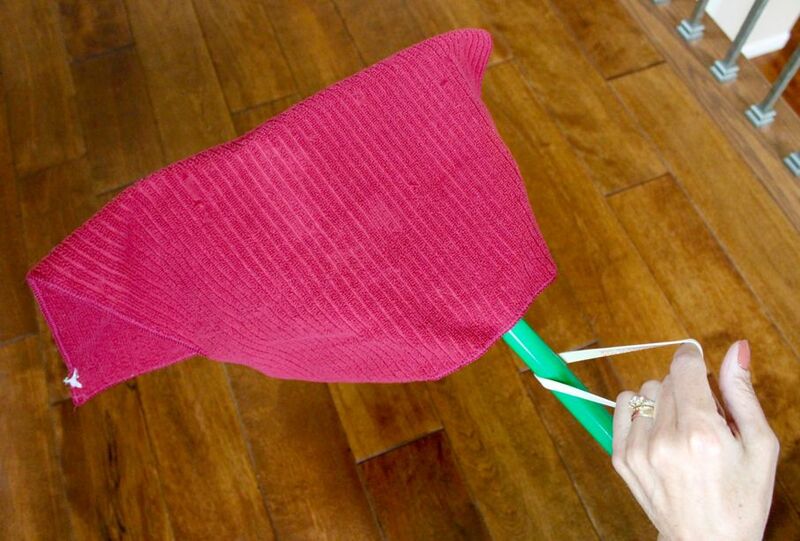 Click here to find out how to dust your ceiling fan without making a mess. I know it sounds too good to be true, but believe me, it’s not! What are some of your favorite cleaning hacks? We’d love to hear your tips and tricks in the comments below!